US President Barack Obama doesn’t see the civil war in Syria ending anytime soon, stating on Friday that it may continue even after he leaves office in 2017. He also objected to the idea that the situation could be resolved by American interference. The comments were made during an interview with the Saudi-owned Al Arabiya news network, which touched on several issues related to the Middle East. When asked if he sees the ongoing conflict in Syria – which began in 2011 – coming to a close by the time he’s out of the White House, Obama said it is unlikely. "I'll be honest, probably not," he said, as quoted by CNN. Obama added that the state of affairs in Syria is "heartbreaking” but “extremely complex." Obama was also asked if his administration’s response to the crisis in Syria could ultimately be equated with the US response to the Rwandan genocide under President Bill Clinton. In 1994, genocide erupted in Rwanda, but the Clinton White House and other international actors failed to prevent it through inactivity. In this case, Obama rejected the question, arguing Syria’s civil war could not be solved by the US alone. 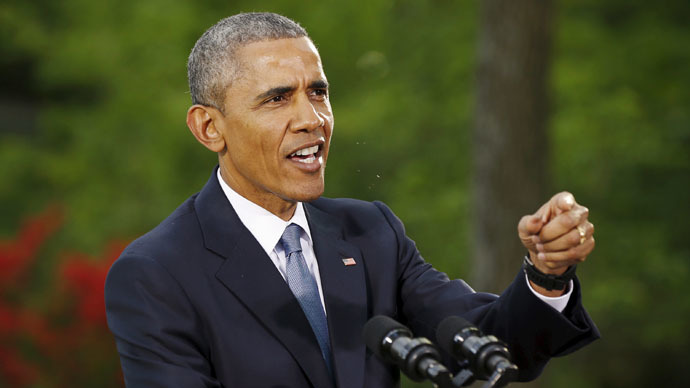 "You have a civil war in a country that arises out of a long standing grievance: It was not something triggered by the United States, it was not something that could have been stopped by the United States," Obama said, according to Reuters. The president went on to say that the US can help nations address their problems but that it can’t solve them unilaterally. "One of the things that I said in the summit... is all too often in the Middle East region, people attribute everything to the United States," Obama said. “The United States ultimately can only work through Arab countries who are also working on their own behalf to deal with these issues." Back in 2013, Obama threatened to use force against Syria over sarin gas attacks that were used against rebel-held area in Damascus, which killed hundreds of people. The Syrian government denied doing so, and the White House rescinded the threat after Syria agreed to get rid of its chemical weapons supply. Pres Obama says the civil war in Syria wasn't triggered by the US and is "not something that could have been stopped by the United States." Earlier this month, though, Reuters reported that international inspectors said they found traces of chemical weapons that were undeclared by the Syrian government. Meanwhile, recent reports have stated that chlorine gas has been used in attacks against Syrian rebels, though the central government has not allowed inspectors to examine the alleged sites. Chlorine is not categorized as a chemical weapon, but Obama said Thursday that the international community could work to ban its use. "If we have the kinds of confirmation that we need, we will once again work with the international community and the organization charged with monitoring compliance by the Syrian government, and we will reach out to patrons of Assad like Russia to put a stop to it," Obama said.